Easily access and analyse all the customized data you need, in real-time, on demand, using highly personalized dashboards? Know that all data and metrics are always consistent and accurate, ensuring a single version of the truth? Gain all-new insights into your business processes not provided by other BI tools? Kofax Insight is a business analytics and process intelligence solution that monitors, analyzes and helps optimize operational business processes to ensure compliance, eliminate risk and gain unprecedented insights to achieve operational excellence. Insight combines process monitoring and analysis with rich business intelligence in a single solution to deliver end-to-end visibility of operational performance and compliance. Kofax Insight is a single unified solution, optimized for operational intelligence. Single point of integration of multiple data sources and centralized definition of metrics (no 3rd party ETL, DW, etc.). Supports both discovery and operational deployment models. The only BI platform with native Process Intelligence. Kofax Insight’s unique MetricsMart architecture allows users to work with large amounts of near real-time data. Supports incremental updating across multiple data sources all on different schedules and latency plans. Dynamic support for disk-based, in-memory or hybrid modes. 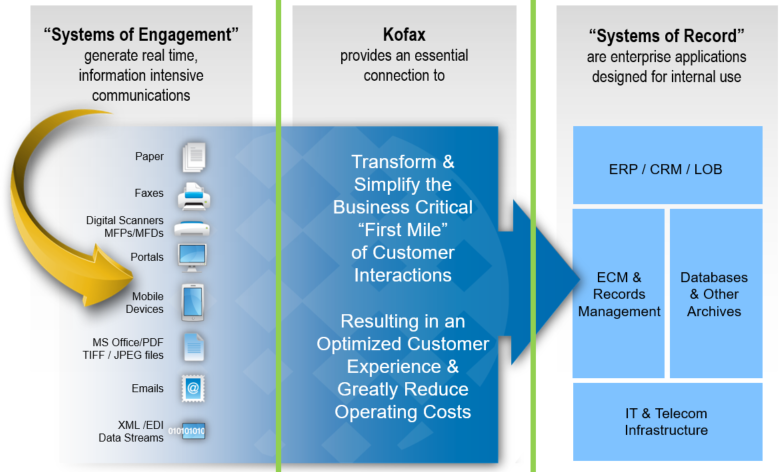 Kofax Insight is a unified platform that does everything from data integration to dashboards. Absolutely no coding of any kind. No need to pre-aggregate data and build data cubes. No third-party products required regardless of the complexity. Kofax Insight meets analyst requirements for governed data discovery/business intelligence platforms. Integration of multiple data sources and definition of metrics can be monitored by IT to ensure consistency and reusability. End users can access and create personalized dashboards and reports on-demand – just point and click. Enterprise scalability and manageability using IT best practices. Process Visibility. The combination of process intelligence and continuous simulation allows you to understand exactly what is on-going in your operation and to predict how even the smallest change in your business may impact your future performance. Process Intelligence. Provides the ability for organizations to capture, organize and display process data which is often contained in many different systems of record and sources, which helps process improvement teams across all industries, especially those that are process-intensive. Power analytics user interface. Insight enables rich dashboard development in minutes with a browser-based, drag-and-drop interface including custom navigation and other rich interactions to optimize the data discovery process. A single integrated solution. A single solution that does not require any third-party technologies to provide data integration, transformation, computation and statistical analysis, process discovery and analysis all the way through the design and delivery. In-memory data analysis and manipulation. Includes MapAggregate, a high-speed, highly scalable distributed in-memory operating mode. Code-free dashboard and report creation. Enables coding-free creation of customized reports, analytic dashboards, data delivery, alerts and more, to all end user devices, from PC to tablet to smartphone. Enables new operational insights into process performance and compliance, based on actual operational data gathered from each instance of a process. This level of insight identifies where waste, inefficiencies and loss (in time, effort and resources) are occurring throughout the process—and where to take corrective action. It provides continuous insight into processes, allowing everyone to see what is actually happening, rather than what people think is happening. Insight’s MapAggregate technology is designed to address the rapidly expanding data volumes and demand for high-speed data discovery by combining the speed of in-memory processing with the scalability and flexibility of a distributed in-memory model. MapAggregate allows Insight to overcome in-memory limitations that exist in other solutions. Using MapAggregate, organizations can scale beyond the resource limits of a single-server by intelligently using the memory and CPU available on any physical or virtual server. Insight is designed to meet the governance demands of IT organizations while supporting the empowerment of end-users promised by data discovery. It is designed to allow IT resources to centrally configure, manage and monitor shared server resources while allowing non-IT users to design and deploy dashboards and reports without requiring IT intervention. To facilitate deployment of Insight as a governed data discovery solution the Insight platform supports a variety of deployment options. The single-platform also means a much faster implementation. Insight customers are typically operational in two to four weeks, much faster than many BI initiatives. And because business doesn’t happen just at a desk, Insight provides access to dashboards on any device with a browser; data is available when and where it’s needed. The platform can even alert users about critical conditions when they are offline via email or messaging. Contact us for more information regarding Kofax Insight.